Wowzers! Isn't this a cute bag? I'm pretty proud of it. Mostly because I came up with the design all on my own. Really. I did. It's fun to just sort of knit on the fly. Well, it's fun to knit on the fly when it works out. Like this time! I'm quite happy with the results. If you can't figure out who this bag is for.... then you've got problems. Big problems. You're probably illiterate. Which means, you probably aren't reading this.... Soo.... moving on. Using the provisional cast on method, cast on 9 stitches. Repeat Rows 3 & 4 once more. R5: p1, cast off 40 sts. Okay! You're at the top of the bag. There are two sections to work next: The handle and the flap. You can do either next. Repeat Row 1-6 until the handle is approximately the length you want, but a little shorter. It'll stretch. Trust me. Pick up the 11 stitches from the side where the handle is suppose to attach and weave together using the kitchener stitch. Onto the flap! As you can see I put a design in mine. You don't have to, but you can! 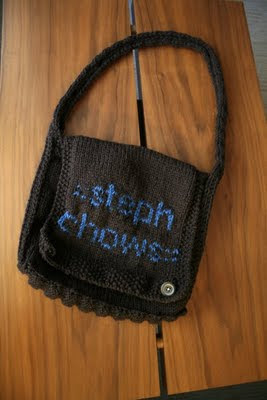 Get some graph paper and design what you want to be on the flap of the bag and then just knit it in! But remember to put it in upside down. You are knitting from the top down after all. This is what you do in general. Sew in loose ends. Pick cute button. Sew on said buttons. Put something in it and then go for a stroll to show it off! So freakin cool!! I love my bag!!! Thank you thank you again!!! rock on girl! !